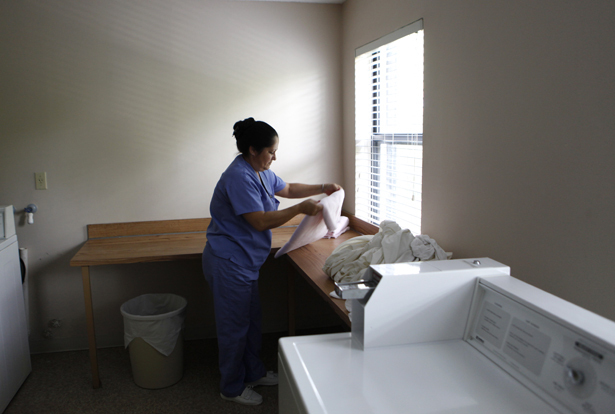 The difficult conditions that affect domestic workers also plague nurses in hospitals. It’s pretty well known that while women dominate the fast-growing fields of domestic work and home health work, this is only a partial victory. After all, not only are these jobs low-paid, they come rife with abuse. But women also dominate other quickly growing healthcare jobs such as nursing, making up over 90 percent of that workforce, which are far better paid. Where a home health aide can expect to make just over $20,000 a year at the median, a registered nurse looks forward to nearly $65,000. This should be a great sign. Yet a new report shows that the abuse that plagues those who work in the home follows women even when they work in a hospital. The report from the Lucian Leape Institute, “Through the Eyes of the Workforce,” reviewed the research and convened roundtables and focus groups to look at the working conditions in the healthcare industry. What it found is widespread abuse. The rate of physical harm for the healthcare workforce, particularly for nurses, is thirty times higher than other industries. In fact, the Bureau of Labor Statistics reports that the injury and illness rate for full-time healthcare workers is 56 percent, compared to 42 percent for all private industries—and remember that this includes dangerous jobs like police officers, construction workers and firefighters. More than three-quarters of nurses surveyed by the American Nurses Association said that unsafe working conditions were interfering with delivering quality care. A third of nurses in a nationwide sample reported back or musculoskeletal injuries in the past year, and 13 percent reported unprotected contact with blood-borne pathogens. The abuse isn’t just physical, though. The report notes, “Health care has a long history of toleration of disrespectful behavior by physicians, and to some degree by nurses, and evidence indicates that this toleration continues.” Overt abuse such as bullying, sexual harassment and even threats of physical assault are often seen as acceptable, as are other less overt ways of judging and mocking workers. Higher-ups also often assign extended hours and dole out unexpected shift changes, not just degrading the workers but impacting their ability to balance their jobs and their families. This should all sound pretty familiar to those who work inside the home. The National Domestic Workers Alliance surveyed the in-home workforce and found disturbingly high levels of abuse. Thirty-eight percent reported suffering from wrist, shoulder, elbow or hip pain, and another 31 percent reported soreness and pain from their jobs. Over 20 percent of nannies and caregivers reported back injuries. A quarter of caregivers and 36 percent of nannies reported contracting an illness while at work. They also endure emotional harm—nearly one in five reported being threatened, insulted or verbally abused. Remember the “end of men” meme? One of the big data points that supposedly showed women on the brink of winning the economy is that they dominate jobs in industries that are growing the fastest. What this narrative never took into account is what these jobs are actually like. Even a “good” job like nursing may not constitute a win for women. In Brooklyn, domestic workers often get contracted as day laborers. Read E. Tammy Kim’s story in the April 1 edition of The Nation.